This most common of all dermatologic conditions seen by dermatologists. What are new developments. What do dermatologists need to best treat their patients? In this issue of Dermatologic Clinics, expert practitioners and academics, Dr. James Del Rosso and Dr. Joshua Zeichner lead distinguished clinicians in presenting such topics as: How the Internet and Social Media Have Changed the Management of Acne; Evaluation of Acne Scars: How to Assess Them and What To Tell The Patient; Pathophysiology of Acne; The Role of Skin Care in the Management of Acne Vulgaris; Top Ten List of Clinical Pearls in the Treatment of Acne Vulgaris; Use of Oral Contraceptives for Acne Vulgaris: Practical Considerations in Real World Practice; Use of Antibiotics in Acne: Achieving Optimal Outcomes While Maintaining Antibiotic Stewardship; Status Report on Oral Isotretinoin: Has Anything Changed That Is Relevant to Clinicians? 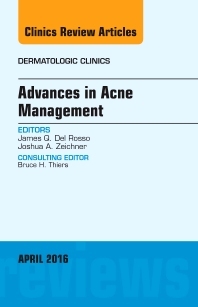 ; Safety Considerations and Monitoring in Patients Treated with Systemic Medications for Acne; Evaluation and Management of Refractory Acne Vulgaris in Adolescent and Adult Men; Physical Modalities in the Management of Acne; 12. Cases of "Acne" That Turned Out To Not Be Acne.